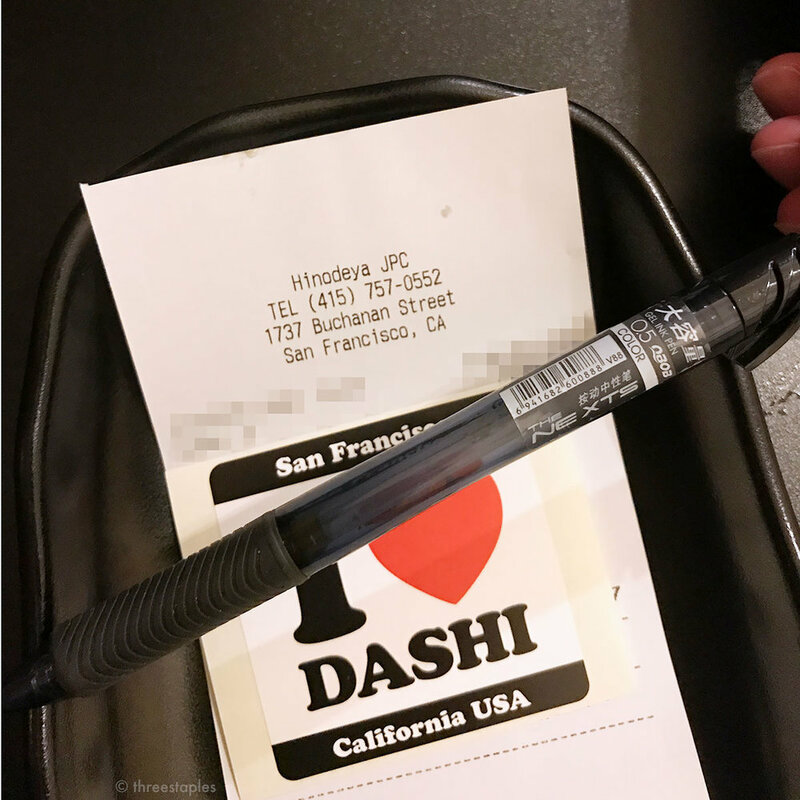 Just for fun, I'd like to give you a little restaurant tour of San Francisco from the viewpoint of the pens they offer for signing receipts. 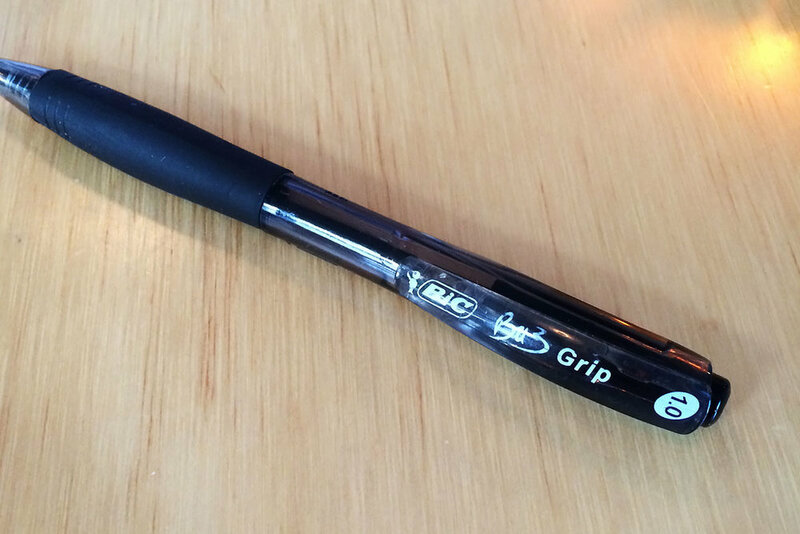 Spoiler: most of these restaurants use ballpoint pens, and they get the job done. There are a lot of popular pizza places in SF, but this is my favorite. Mr. Three Staples and I always get the Insalata Tricolore and whatever the special pizza of the day is. Their “Cherry Pie” (a pizza topped with cherry tomatoes) is highly recommended in the summer when tomatoes are in season. A great Japanese restaurant at an unassuming, former diner space. Not your typical Americanized Japanese menu. Friendly owner. Too bad they don’t do lunch anymore. A decent, casual place to hang out with friends. I think the food was pretty good. It’s been awhile. Sort of an upscale taco place with decent food. I’m not a connoisseur of Mexican food, so I wouldn’t know how to judge, but I like their fish taco. A dependable, neighborhood spot. 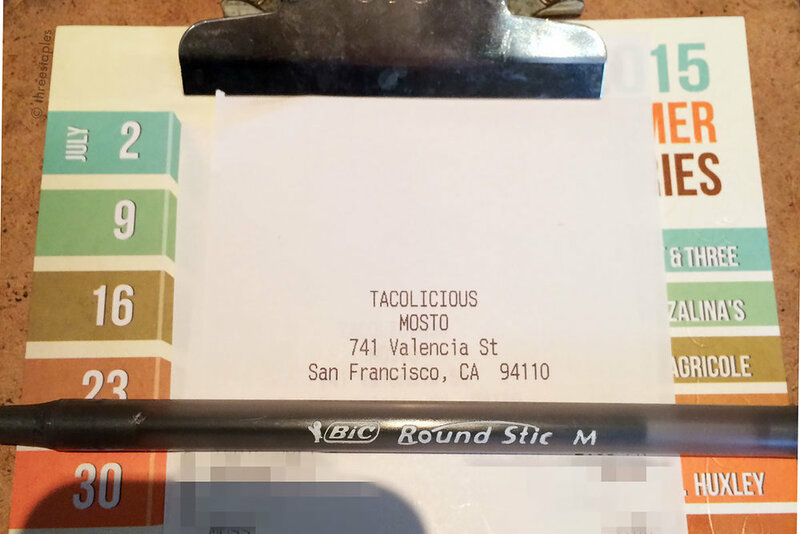 And I don’t know if it was intentional, but I like how they put a piece of paper between the clipboard and the receipt, making the writing surface not too slick. One of our favorite among the newer restaurants. We like that they seem to put more focus on seafood and vegetables than on meat dishes. Oh, a rare gel pen sighting! 😄 There are a lot of ramen restaurants in SF that people line up for, but my favorite so far is Hinodeya. A lot of places do heavy tonkotsu soup, but this place focuses on lighter fish-based soup (hence “I ❤️ dashi”). Love their noodles, too. Their Zen Ramen is clearly not an afterthought, either, with an amazing, complex vegetarian broth. It’s been a long time, but I remember it was kinda loud. Food was just okay. Another place I went to a long time ago, but I think it was good. I had an entrée that had the most phenomenally cooked potatoes in it. That’s the only detail I remember. A decent place to dine at a popular shopping mall. Great decor and ambiance. But what a random pen. Points off! A short-lived restaurant. Very posh space but forgettable food. But no one would accuse them of not trying. I mean, look at that fancy pen! Saved the best for last! An awesome, awesome restaurant that has become our go-to place for special dates. Every dish, every meal has been satisfying to both of us, and that is no small feat. Start with a Market Shot to drink and finish with the Lumberjack Cake for dessert. Do not skip the Applewood Smoked Bacon Beignets. Also, I wouldn’t want to keep any of these restaurant pens mentioned here, but with this one, I went “Ooh~!” What a handsome pen. I hope you enjoyed this tour. 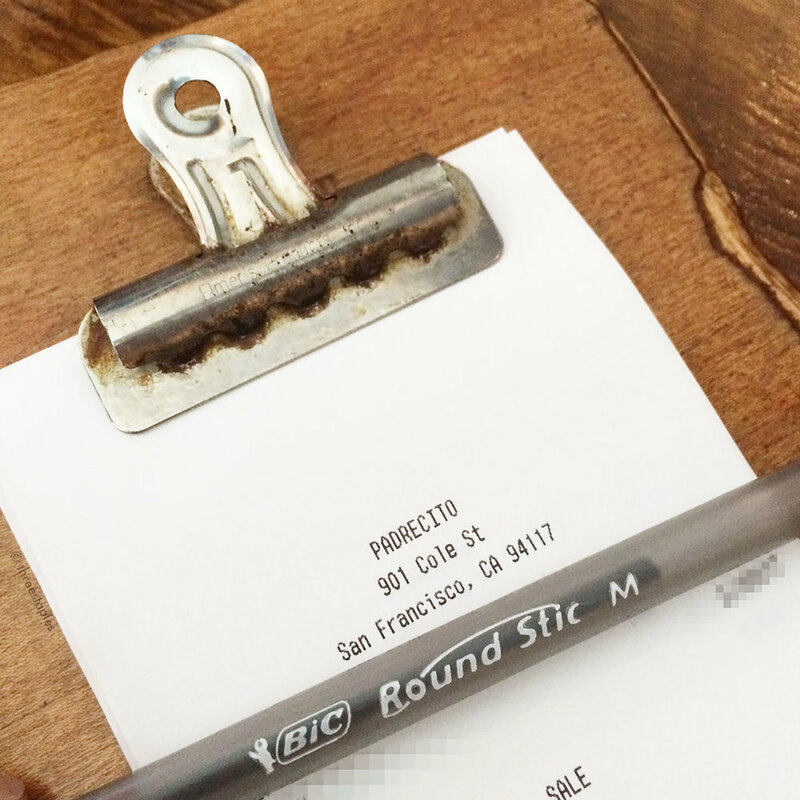 Looks like Bic ballpoint pens are a clear winner among restaurants! Only one gel pen! 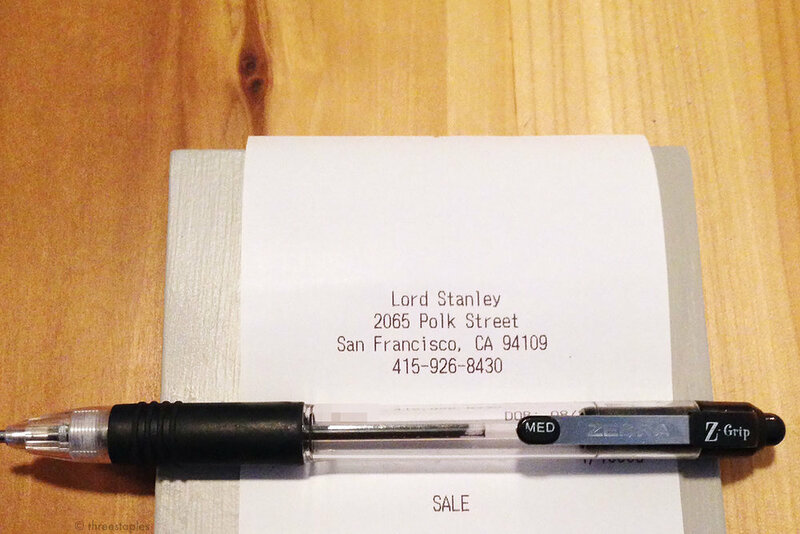 If you owned a restaurant, what pens would you have your customers use for check signing? 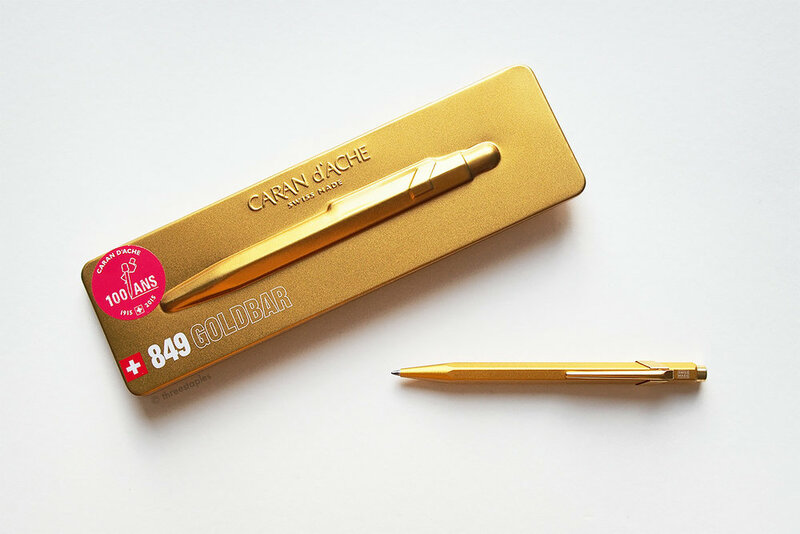 Earlier this month, I received this Caran d’Ache 849 Goldbar ballpoint pen as a gift. I've tried many wooden pencils from Caran d’Ache (and loved them), but never their pens, so I was really excited to try this as soon as possible. This post isn’t going to be an in-depth look at the pen (links to many existing reviews of this model are at the end of this post), but I’m really loving the overall design, especially how the hexagonal barrel tapers to the tip without any gaps, similar to a sharpened pencil. I also like how it’s slim and relatively lightweight. But ballpoints are not my favorite type of pens, and the 849 will not be changing my opinion on that any time soon. The included “Goliath” refill writes okay, but it’s too sensitive to writing angle, and it’s in a medium blue color that I do not like. So I looked for black gel refills! A quick search told me that there’s probably no exact match for this “Goliath” refill but that a “Parker-style” refill should be pretty close, as long as you shorten it. 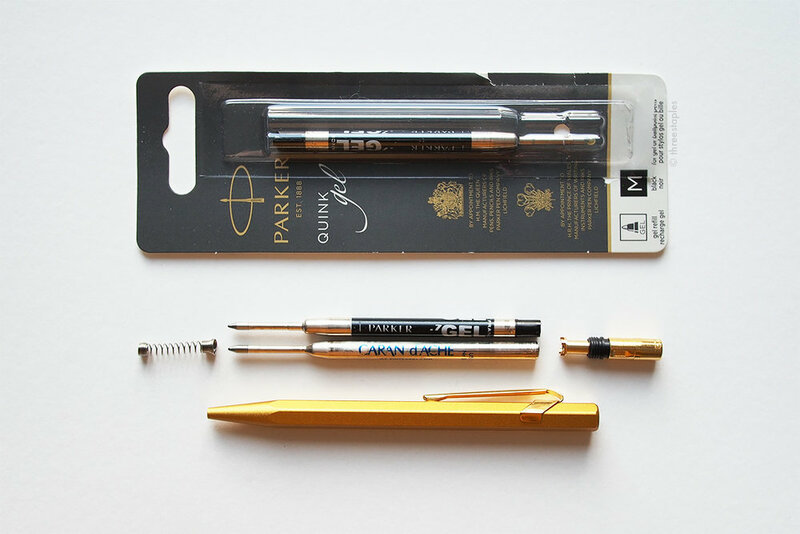 The first ones I found were these Parker Quink Gel refills in black. I trimmed the top end of one with a craft knife by just eye-balling it (pictured above is the shortened version, right next to the original refill). From top: Parker Quink gel refill in black, the same refill with a few millimeters cut off, and Goliath refill in medium blue. Success! Once in a blue moon, I have to click the pen twice to get the tip out, but I can deal with that. (Your mileage may vary 😅). The 849 is a pen I really want to try using for a long period of time, so I’m happy I was able to get a better refill. And the ink flows well, too. I would’ve preferred a finer tip (this one is just labeled “medium”; see quick comparison in the last picture), but I’ve been using it with my Field Notes on the go, and it’s been working better than I expected for quick notes. From top: Ohto PG-105 NP gel refill (black, 0.5 mm), Caran d’Ache Goliath refill, Parker Quink Gel refill. With untouched Ohto refill inside, retracted. It peeks out a little! I will have to shorten it when I’m ready to use it. Just a few days ago, I got this Ohto Flash Dry Gel Pen refill in black 0.5 mm (PG-105NP) that could also work with the Caran d’Ache 849. A finer tip! I haven’t shortened it yet, not when the Parker refill is still so new, but it fits. It makes a faint rattle-y noise though. Field Notes “Wednesday” in Daily Carry. The 849 fits in the pen loop nicely. 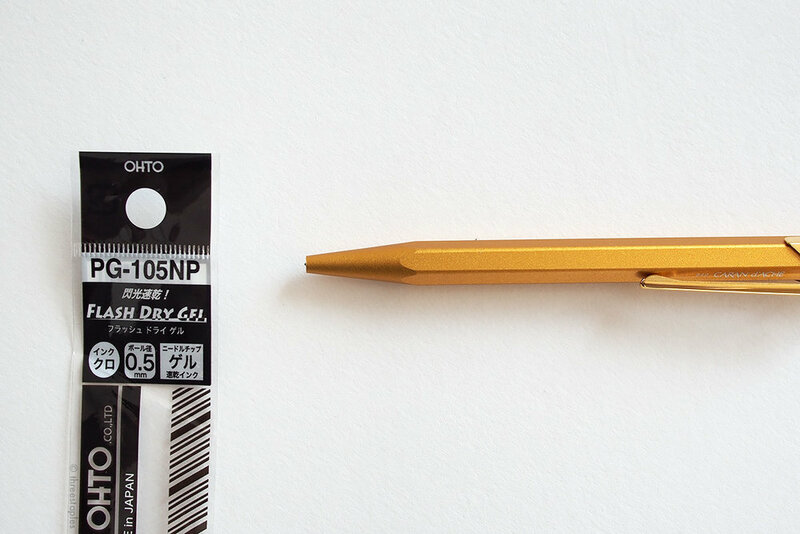 The Parker Quink gel refill in medium is definitely thicker than 0.5 mm. Do you own any Caran d’Ache 849s? What refill do you use with it? If you know of any gel refills that don’t require trimming, let me know! While searching, I came across an adapter by a Japanese company UNUS Product Service that allows many other ballpoint refills to be used with the 849. Interesting! Amazon links in this post are affiliate links, which means, if you follow these links and make a purchase, I'll earn a tiny commission. Every little bit will help support the hosting of this site, and I’d very much appreciate it.